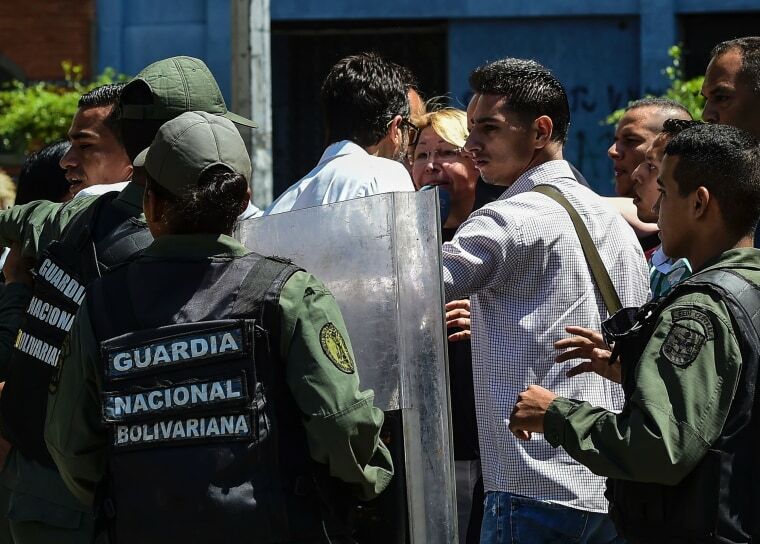 CARACAS, Venezuela — Venezuela's new pro-government constituent assembly on Saturday removed dissident state prosecutor Luisa Ortega from her job, in what critics called a blatant affront to democracy. The new constituent assembly, which Ortega said was fraudulently elected last weekend, unanimously decided to remove her in its first session on Saturday. Earlier in the day, security forces had taken up position in front of her office, blocking Ortega from entering the building. She left on a motor bike amid the chaos. The head of the Organization of American States condemned what he called a "flagrant violation" of the prosecutor's institutional independence. And the Inter-American Court of Human Rights, an autonomous arm of the OAS, granted "precautionary measures" of protection for Ortega, saying she faces imminent risk of harm after senior officials linked her to alleged "terrorism." The constitutional assembly was seated despite strong criticism from the United States, other countries and the Venezuelan opposition, which fear the assembly will be a tool for imposing dictatorship. Supporters say it will pacify a country rocked by violent protests. But the opposition is struggling to regain its footing in the face of the government's strong-arm tactics and the re-emergence of old, internal divisions. Several opposition activists have been jailed in recent days, others are rumored to be seeking exile and one leader has broken ranks from the opposition alliance to say his party will field candidates in regional elections despite widespread mistrust of Venezuela's electoral system. In a sign of its cowered and demoralized state, only a few hundred demonstrators showed up for a Friday protest against the constitutional assembly, one of the smallest turnouts in months. Those who did turn out said fear of arrest — rights groups claim there are more than 600 "political prisoners" jailed during the protests — may be keeping people at home but urged Venezuelans to remain mobilized. "This is what the constitutional assembly will bring: more repression," opposition lawmaker Miguel Pizarro said. However, Maduro accuses his opponents of using violence and argues that the constitutional assembly is the best way to restore peace. On Friday he heralded security forces who have been on the front lines of daily street battles, claiming that 580 of them had suffered serious injuries from attacks by "terrorist" protesters. "I feel deeply the wounds of each one of you," Maduro said addressing a small group of injured national guardsmen. "With your bodies as your shield, you have defended the right to peace." An increasing number of foreign governments have sided with the opposition, refusing to recognize the constitutional assembly and further isolating Maduro's government. On Friday, the Vatican urged Maduro to suspend the new body, expressing "deep worry for the radicalization and worsening" of the turmoil in Venezuela. President Donald Trump and his French counterpart, Emmanuel Macron, agreed that Maduro must restore the rights of the Venezuelan people in a phone call, according to a readout of the conversation by the White House. Foreign ministers from several South American nations said they will gather Saturday in Brazil for an emergency meeting to decide whether to expel Venezuela from the Mercosur trade bloc for violating its democratic norms. Venezuela was suspended from the group in December.